As all too many parents know, getting kids to eat fish can be an endless challenge. Just yesterday, a grandmother told me that her two grandkids, aged 3 and 7, had never even tried fish. Zowzers! Pretty astounding but I truly feel the pain of any parent who can't seem to turn their kids on to fish, especially when certain kinds of fish offer a whole host of health benefits. Whenever the fish monger at our local farmers' market has fresh sole in season, I buy a bunch of filets from her to make a huge batch of Crispy Fish Fingers. I bake some fingers that night for dinner, the rest I freeze for another night when I have to get a quick dinner on the table. 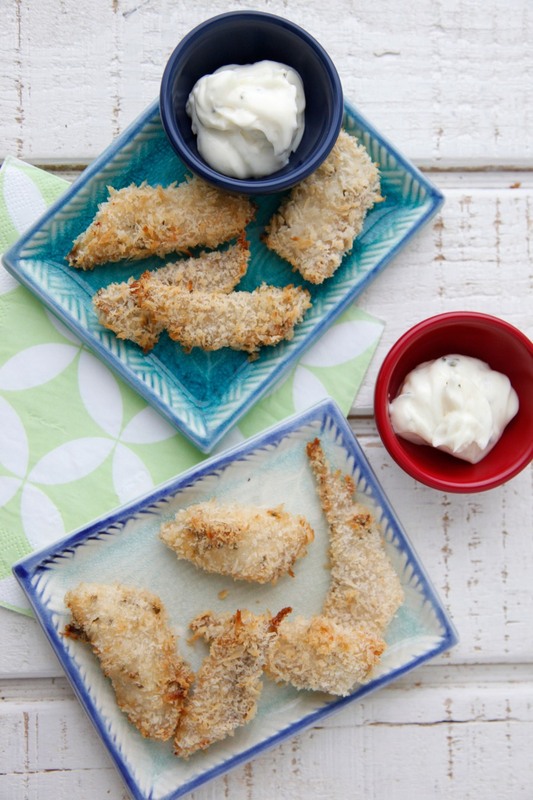 These Crispy Fish Fingers live up to their name. 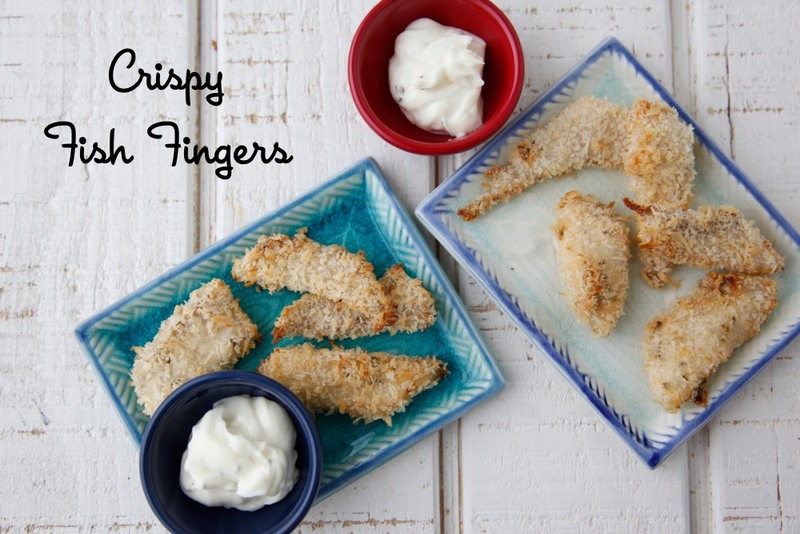 They are seriously crispy on the outside, and moist, flakey and mild in flavor on the inside. They're delicious and nothing like the boxed kind you may have been forced to eat as a child -- for starters, they're made with just a handful of ingredients and therefore a whole lot healthier. Plus, with just a light coating of herb infused mayonnaise for the bread crumbs to grab onto, it's like having a little tartar sauce baked into every bite. So don't be scared anymore to offer your kids fish, or be fearful that they will turn their noses up at anything you serve. Keep trying different varieties and experimenting with ways of preparing it and eventually you'll hit pay dirt. My guess is that when you take a chance with something simple like these beauties, it won't be too long before fresh fish moves quickly into their food-o-sphere! 1. Preheat oven to 425F. 2. Slice the fish into 1/2 inch x 2 inch strips or \\\\\\\"fingers\\\\\\\". 3. In a medium bowl, stir together the mayonnaise, oregano, garlic powder, and salt. Mix until smooth and well combined. Separate the sauce in half and set half aside. 4. Place the bead crumbs on a plate. Make an assembly line with 1/2 of the mayonnaise mixture and the breadcrumbs. 5. 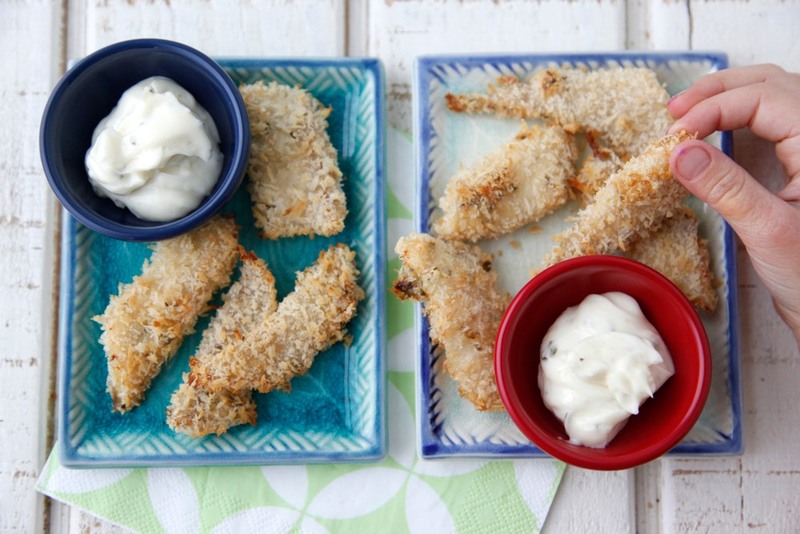 Gently roll the fish fingers in the mayonnaise mixture and then roll in the breadcrumbs to coat. 6. Place the coated fish on a metal rack that has been set on a baking sheet and sprayed with oil. Lightly spray the fish sticks with oil. Bake for 12-15 minutes, until the fish is flaky inside and golden brown outside. 7. 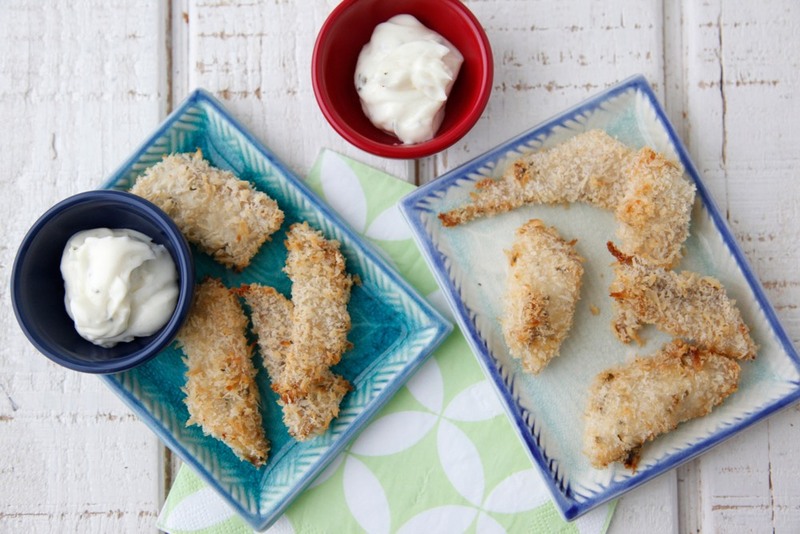 Use the second 1/2 of the mayonnaise mixture as a dipping sauce for the cooked fish. Note #1: This may seem like a small amount of sauce, but the fish only requires a thin coating of it before rolling in the breadcrumbs . You’ll need to lightly press the fish into the mayonnaise mixture, or sort of brush it on with your fingertips. Note #2: If you have a convection oven, set it to 425F and cook the fish for 12 minutes. i can't imagine kids not eating fish. Our 3 year old granddaughter has been eating fish since she was old enough (ok before that really). We live by \"we eat what is served\" NOT we fix special kiddie foods. She eats everything and, the only dip she eats is the ocasional ketchup. This looks awesome! Can they be freezed if using fresh fish? Do you bread the fish then freeze or do you bread the fish, bake it, then freeze it? Definitely going to try this! Some parents aren't as lucky as others to have kids that \"eat what is served\" so preparing things that are more appealing are great! I have one of each, one that eats what is served and one that refuses practically everything. Thanks for all the great ideas/suggestions!! Sounds yummy. We also make a version where we add a little parmesan cheese to the breadcrumb mixture and the kids love it. This couldn't have come at a better time! Out of nowhere my 3 n 2 year olds have decided they \"don't like fish anymore!\" Every Tuesday is fish night , so I cant wait to surprise them with this! Wish me well Lol! You still use tilapia even with all the stories about it? Yummy! I love making homemade fish sticks and chicken nuggets! They're so much better than anything store bought! Would cod work for this recipe? Silly question: Should I use fresh oregano or would dried be okay? What's the best way to get the fish filets into fingers? With a knife? Break them along the \"grain\" by hand? Do you think I can use yogurt instead of mayo? Thanks. I clicked on the \"egg free\" menu and found this recipe. While there aren't any eggs in this recipe, mayonnaise is an egg based condiment. This recipe is great, but it may need to be moved to a different category. Can you freeze these after you cook them? I'm just wondering if anyone has tried yogurt or greek yogurt with these? ?